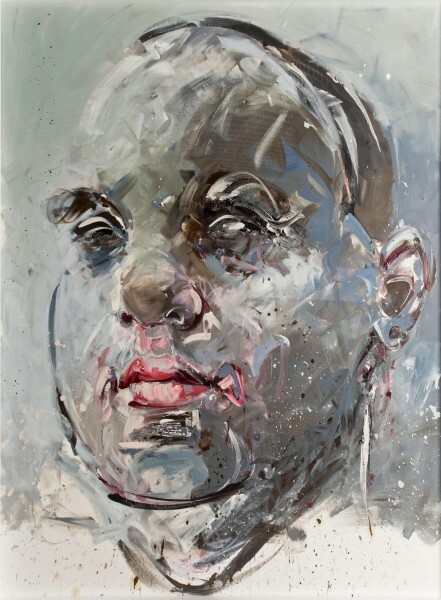 A self taught painter, Phillipe Pasqua produces canvases and drawings that are oversized in both scale and intensity. These large portraits, lacking in recognizable details, are the primary focus of the artist. Basing his work on photographs of people at the margins of society, his retreat from the subject is intensified by his rendering of surface texture. Any representation of a familiar space is absent from these works. Whatever the relationship is between the artist and his subjects, it is not visible. Instead, the viewer is given keys to construct their own conclusions based on what they see. The artist presents his vision in a frenzy of brushstrokes. His pictorial touches aggravate the canvas, making the image almost brutal, and his choice of colors, including blood reds and bruised blues, creates an undeniable vibration on the surface of the canvas. Born in 1965, Grasse, France; Works and lives in Paris, France. - Borderline, Oceanographic Museum of Monaco, Monaco. - Recomposition, Galerie RX, Paris, France. - Domaine de Chambord, France. - Galerie RX, Paris, France. - Fondation Fernet-Branca, Saint-Louis, France. - Art Revolution Taipei, Taiwan. - Work in Progress, The Storage, Paris, France. - Gallery Hyundai, Seoul, South Korea. - 604 Gallery, Busan, Seoul, South Korea. - Art Paris, Galerie Strouck, Paris, France. - Moscow Museum of Modern Art, Moscow, Russia. - Ahlers Foundation, Hanovre, Germany. - Crâne, Art Curial, Paris, France. - Pulsion, Galerie RX, Paris. - Patrick Painter Gallery, Los Angeles, USA. - Spike Gallery, New-York, USA. - Métamorphoses, Galerie RX, Paris, France. - Galerie Hengevoss Dürkop-Jensen, Hambourg, Germany. - Lucille, Galerie RX, Paris. - Les miroirs de l’âme (Portraits 1989-2001) Palais Bénédictine, Fécamp, France. - Bloc Portrait Galerie Hengevoss-Dürkop, Hambourg, Germany. - Trauma Galerie Hengevoss Dürkop-Jensen, Hambourg, Germany. - La Machine à Eau, contemporary art center, Mons, Belgium. - Espace Yvonamor Palix, Mexico City, Mexico. - Galerie Boulakia, Paris, France. - Château de Grouchy, France. - Espace Dautzenberg, Bruxelles, Belgique.The International Center, Detroit, USA. - Galerie Woo Mang et Partners, Paris, France. - Espace Confluence, Paris, France. - Oceanographic Museum of Monaco, presentation of the "Mâchoire de Mégalodon," Monaco. - Damien Hirst vs Philippe Pasqua SKULL, Galerie Laurent Strouk, Paris, France. - Drawing now, Galerie RX, Paris, France. - Art Paris, Galerie RX, Paris, France. - Art Miami, Galerie RX, Paris, France. - Newera, Galerie RX, Paris, France. - Pasqua - Mc Quinn, Singapore. - Art Paris, Galerie RX, France. - Vanité, Musée Maillol, Paris, France. - FIAC, Patrick Painter, Paris, France. - Biennale, Monumental Sculpture, Venice, Italy. - FRIEZE, Patrick Painter, London, UK. - Soutine and Modern Art, Cheim & Read Gallery, New York, USA. - Quintessence, Galerie RX, Paris, France. - Galerie Hengevoss Dürkop, Hamburg, Germany. - Launch, Galerie RX, Paris, France. - Face off, Galerie Aeroplastics-Damasquine, Brussels, Belgium. - Narcisse Blessé, Passage du Retz, Paris, France. - Naço & Friends, Espace Via, Paris, France. - 80 artists around the Global, Galerie Enrico Navarra, Paris, France. - Hygiéne Espace d’Art Yvonamor Palix, Mexico & Paris, France. - Hygiéne Foundation La Source, La Gueroulde France. - Collection Ahrenberg : 50 ans d’histoire de l’art, Museum of Fine Arts, Mons, Belgium. - 3 Visions of French Contemporary Art, Galerie Martini, Hong-Kong, China. - Philippe Pasqua - Autoportrait, interviews with Cyr Mald, Séguier Editions. - Skull Box, Text by André Chabot, Edition YNOX Paris, France. - Monographie, Editions du Regard. - girls skulls butterflies, text by Jean Corbu, Galerie Laurent Strouk Edition. - « Paradise »(English/Russian), Skira Edition, 250 p.
- « One thousand, Mille pages, mille sculptures, mille dessins ». - « Œuvres de 1994 à 2005 », Ed. la Différence. - « Philippe Pasqua », Special issue, Beaux-Arts Magazine. - « Paradis blanc », exhibition catalogue, Galerie RX, Paris. - « Interview », Interview by H-F. Debailleux. DVD, Galerie RX, Paris. - « Les miroirs de l’âme », exhibition catalogue, Palais Bénédictine, Fécamp. - « Trauma », exhibition catalogue, Galerie Hengevoss Dürkop, Hamburg, Germany. - Monographie, text by Pierre Restany and Jean-Michel Ribettes.